Boy Scout Troop 50 | Chattahoochee Council | Auburn, Ala. | #troop50: BSA: Boy Snake-handlers of America?!?! BSA: Boy Snake-handlers of America?!?! After Saturday's breakfast at Camp Jack Wright, Troop 50 Scouts learned about snakes from the camp's committee chair Rob Turner. 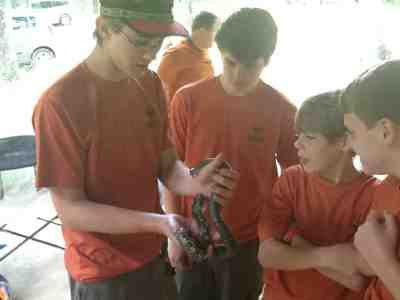 In addition to learning more about non-venomous and venomous snakes native to Alabama and the Southeast, Scouts also became better acquainted with snakes' behavior, characteristics and environmental preferences. For those wishing to put "A Scout is Brave" to the test, there were opportunities at the end of the session for some up-close, hands-on snake handling by Scouts and leaders. We'll post more photos online as technology allows, but know that no Scouts (or leaders) were harmed in the making of this blog post!